Pair of table decorations, of metal, having a distressed finish, each fashioned as a leafy pineapple, set upon a classical fluted urn, on round foot, and square plinth. Can be made into lamps, if desired. CONDITION: Distressed, but excellent condition. Desirable wear and oxidation to patina, creases and dents to metal consistent with age and use. 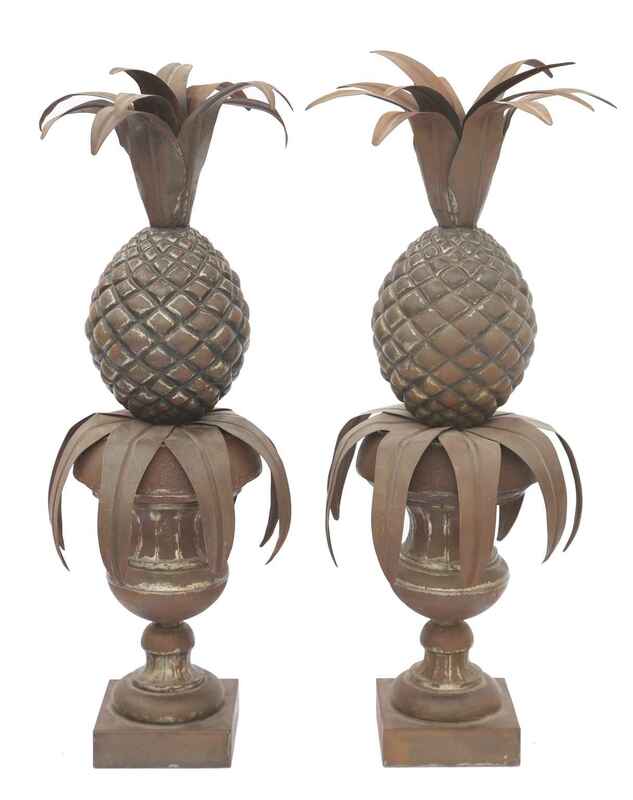 Pair of table decorations, of metal, having a distressed finish, each fashioned as a leafy pineapple, set upon a classical fluted urn, on round foot, and square plinth. Can be made into lamps, if desired. CONDITION: Distressed, but excellent condition. Desirable wear and oxidation to patina, creases and dents to metal consistent with age and use.